ERCOT power stayed in sync with the natural gas market, following the static trend in the early week, with a mid-week bubble and declining prices for the remainder. ERCOT Prompt month deliveries closed at $51.20/MWh, decreasing $1.73/MWh or 3.37%. 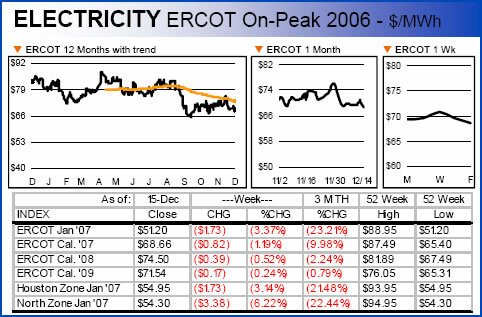 ERCOT � finished the week at $74.50/MWh down 0.52%. ERCOT � closed the week at $71.54/MWh down 0.24%. The prompt month for the Houston Zone finished at $54.95/MWh a decrease of 3.14% and the prompt month North Zone finished at $54.30/MWh down 6.22%. Northeast power prices matched the natural gas curve with prices climbing mid-week then gradually falling off hitting new 52-week lows in the reported zones. Prompt month prices for the Northeast are 26% to 30% less than 3 months ago for the same trading month. 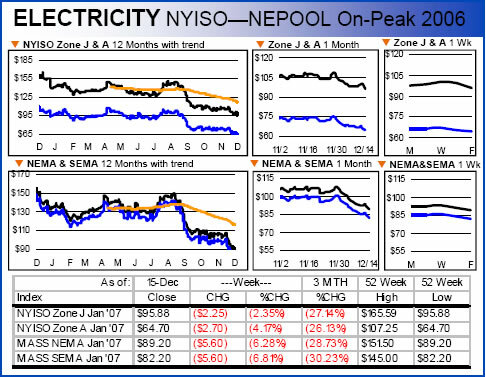 NYISO Zone J prompt month closed the week at $95.88/MWh decreasing $2.25/MWh a change of 2.35%. NYISO Zone A prompt month finished at $64.70/MWh a loss of $2.70/MWh or 4.17% Massachusetts NEMA prompt month closed down at $89.20/MWh a change of 6.28% or $5.60/MWh. Massachusetts SEMA prompt month finished the week at $82.20/MWh, decreasing 6.81%. PJM power prices for the reported zones reached new 52-week lows as gas prices fell last week. Cinergy prompt month finished the week at $54.47/MWh, a change of 5.10% decreasing $2.78/MWh. NI Hub prompt month finished down $3.03/MWh to close at $54.22/MWh, a change of 5.59%. 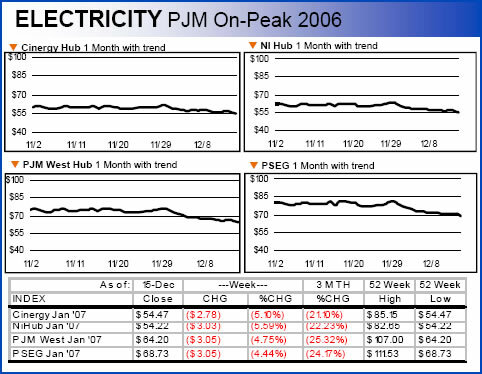 PJM West Hub prompt month lost $3.05/MWh closing at $64.20/MWh, a change of 4.75%. PSEG prices for the prompt month closed at $68.73/MWh, a change of 4.44% or $3.05/MWh. Compared to 3 months ago, PJM prices are 21% to 25% less for the same trading period. 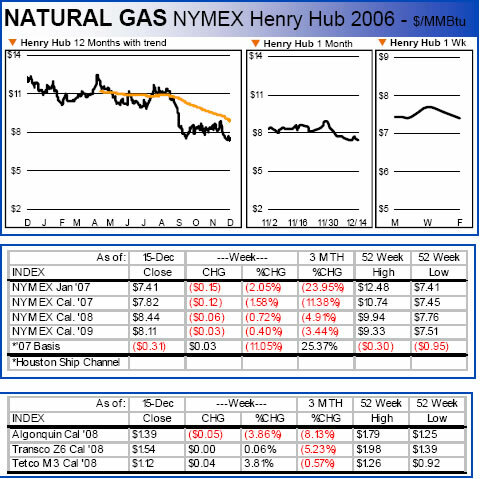 Natural gas prices were static in the early part of the week. Prices spiked midweek then gradually declined. NYMEX prices for the prompt month finished the week at $7.41/MMBtu a decrease of 2.05% or $0.15/MMBtu. January 2007 prices are 23.95% lower than 3 months ago for the same delivery period. NYMEX Cal. � closed at $7.82/MMBtu a change of 1.58%, down $0.12/MMBtu. NYMEX Cal � finished the week at $8.44/MMBtu; NYMEX Cal � closed at $8.11/MMBtu. Algonquin, Transco Z6, and Tetco M3 prompt month closed at $1.39/MMBtu, $1.54/MMBtu, and $1.12/MMbtu respectively. 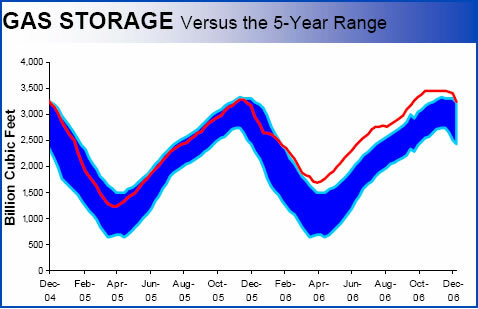 Working gas in storage was 3,238 Bcf as of Friday, December 8, 2006, according to EIA estimates. This represents a net decline of 168 Bcf from the previous week. Stocks were 245 Bcf higher than last year at this time and 225 Bcf above the 5-year average of 3,013 Bcf. In the East Region, stocks were 84 Bcf above the 5-year average following net withdrawals of 93 Bcf. Stocks in the Producing Region were 101 Bcf above the 5-year average of 854 Bcf after a net withdrawal of 55 Bcf. Stocks in the West Region were 40 Bcf above the 5-year average after a net drawdown of 20 Bcf. At 3,238 Bcf, total working gas is above the 5-year historical range. Non-Organization for Economic Co-operation and Development (OECD) Europe and Eurasia and the Middle East account for almost three-quarters of the world抯 natural gas reserves, but in 2003 they accounted for only 39 percent of world production. Together, these two regions account for 47 percent of the projected increase in global natural gas production from 2003 to 2030, much of it for export to OECD countries. Russia is already the world抯 single largest exporter of natural gas, with net exports of 6.3 trillion cubic feet in 2003, all of it by pipeline. There are also some plans to export natural gas from the Middle East, but much of the region抯 increase in production is projected to be used domestically梡articularly in the electric power sector, where shifts from petroleum to natural gas allow the producing countries to monetize more of their oil assets through export. Natural gas production in non-OECD Asia also grows substantially over the projection period, but all the growth in supply is required for consumption within the region, and imports are needed to fill the shortfall. In Central and South America, natural gas production outpaces regional demand. As a result, Trinidad and Tobago continues to export LNG outside the region. Peru, and possibly Venezuela, may also begin to export LNG outside the region over the course of the projection. In 2003, the OECD countries accounted for 41 percent of the world抯 total natural gas production and 52 percent of total natural gas consumption; in 2030, they are projected to account for only 25 percent of production and 40 percent of consumption. Natural gas supply from the OECD nations increases by an average of only 0.5 percent per year in the IEO2006 reference case, whereas demand increases by 1.5 percent per year. As a result, the OECD countries rely increasingly on imports to meet natural gas demand, with a growing percentage of traded natural gas coming in the form of LNG. OECD countries rely on natural gas produced in other parts of the world to meet more than one-third of their natural gas consumption in 2030, up from 22 percent in 2003. LNG is expected to become an increasingly important source of supply to meet the world抯 demand for natural gas. Although there were only 12 LNGexporting countries in 2004-6 the number is increasing. In 2005, Egypt joined the ranks of LNG producing countries with the start of two separate liquefaction projects. Russia also entered the LNG business in 2005, not with LNG it produced but with LNG for which it traded pipeline natural gas. Not until 2008, when the Sakhalin liquefaction project is expected to start operations, will Russia become an LNG-producing country. Norway and Equatorial Guinea also have their first liquefaction terminals under construction, and construction on the first liquefaction terminal in South America is scheduled to begin in 2006 in Peru. The number of countries installing the infrastructure necessary to accept LNG imports is also increasing. More than 30 years had passed since the United Kingdom imported LNG, but in 2005 it rejoined the ranks of LNG importers, with the startup of its Isle of Grain regasification terminal. China, Canada, and Mexico all have their first LNG import terminals under construction; and Germany, Poland, Croatia, Singapore, and Chile are among the other countries considering their first regasification terminals.